A POSTER for a concert that never took place by a band that didn’t exist at the time was at the centre of a Limerick music mystery this week. In January, Nicky Woulfe of Woulfe Event Management presented a poster to Mayor James Collins to mark the first anniversary of the death of Cranberries singer Dolores O’Riordan. The accuracy of the poster, said by Mr Woulfe to have been from one of O’Riordan’s “early gigs in Limerick”, was questioned this week. One local musician who contacted the Limerick Post took issue with the poster claiming, “it appears suspect as The Cranberries were still called The Cranberry Saw Us until 1991 and Dolores hadn’t joined the band yet”. The poster presented to Mayor Collins advertises a performance from The Cranberries in support of local band A Touch of Oliver at The Speakeasy on O’Connell Street on February 23, 1990. 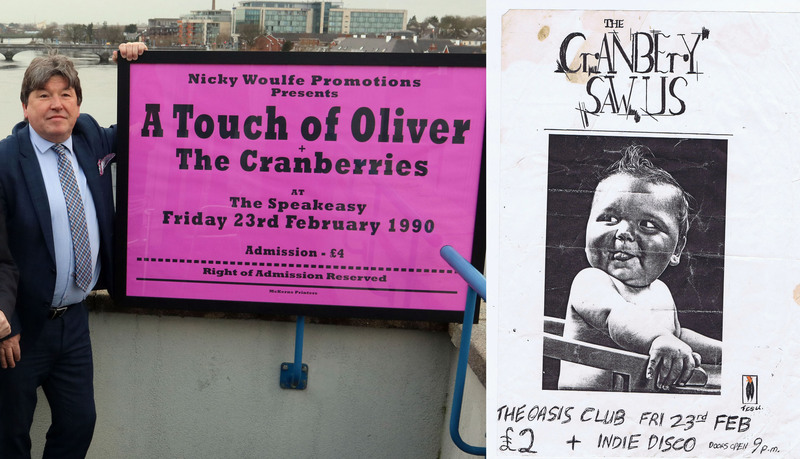 However, the Limerick Post has established that The Cranberry Saw Us actually played one of their very last shows with former singer Niall Quinn at the Oasis Club on Lower Glentworth Street the same night. “The Cranberry Saw Us, as they were known at the time, did play in the Speakeasy much later that year on November 10. They were still using The Cranberry Saw Us moniker as late as April 1991. Dolores arrived on the scene in the spring of 1990 so this gig couldn’t have taken place on February 23 and anyway they didn’t change their name for another year,” one local musician told the Limerick Post. Another local source confirmed that the Cranberry Saw Us show with A Touch of Oliver on November 10, 1990 was the only time the band ever played what is now The Texas Steakout in Limerick. The poster was taken from the ‘Music Memories and Memorabilia’ collection, the personal collection of Nicky Woulfe. The Limerick collector recently made a presentation to the Council seeking €30,000 towards framing this private collection of musical memorabilia. “I promoted hundreds of gigs five nights a week in the Speakeasy at the time and our printing for the front window was handled by McKerns printing. All posters for this area were large to cover the window space because it was a great advertising area. In an earlier statement, Mr Woulfe responded to a report in last week’s Limerick Post about possible delays to a proposed Council funding allocation of €30,000 to his music memorabilia project. “A commitment of €30,000 had been promised to this tourism project by the Metropolitan Mayor Daniel Butler along with his Fine Gael colleagues Cllr Elenora Hogan, Cllr Marian Hurley, along with Fianna Fail Mayor James Collins, and Cllrs Jerry O’Dea, John Gilligan and Cllr John Costello,” he claimed.